A historical and magnificent ceremony was held on Sunday 25th March 2012 at Letchworth Dhamma Nikethanaya Buddhist Cultural Centre for Education Meditation Psychotherapy & Counselling to celebrate 08th Anniversary of the Centre, and to felicitate the Founder & Head of the Centre Venerable Akurala Samitha Thero. This remarkable Felicitation Ceremony was organized to congratulate Dhamma Nikethanaya Community and invoke the blessings to proceed from strength to strength and share them with all the members, supporters and well-wishers of the centre. Blessings were also bestowed to mark the 08th Anniversary of The Centre (19th April), 40th Birthday of Venerable Akurala Samitha Thero (25th March) the founder and head of the centre, Diamond Jubilee (60th Year in reign) of Her Majesty The Queen (6th Feb 1952) and Peace & Sovereignty in Sri Lanka (63rd Anniversary or 64th Independence Day on 04th February and 3rd Anniversary of Sri Lanka's End of Civil War on 18th May). Over 300 devotees attended the two part mass ceremony. 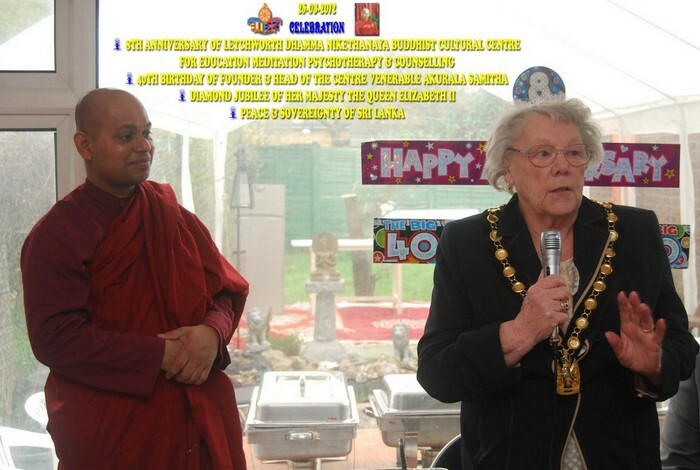 The first part was held at Letchworth Dhamma Nikethanaya Buddhist Cultural Centre with a special Dana Blessings Ceremony (Food Offerings to Venerable Monks & Sharing of Food with devotees). 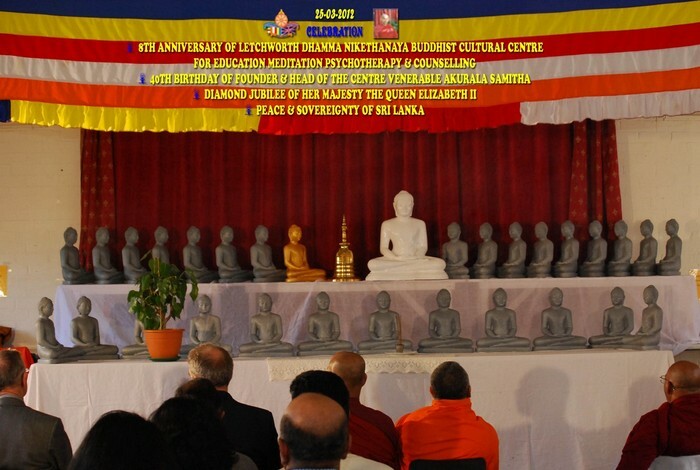 The second part was the Special Felicitation held at Brotherhood Hall in Letchworth with a Guided Meditation on Reflection on The Lord Buddha and his teachings, a Keynote Guest Speech on "Buddhism: The Science of Happiness not a Message of Suffering", Followed by a blissful and historical ceremony of Offering 30 Buddha Statues, newly sculpted in Sri Lanka for exclusive veneration in UK. Seven Monks representing UK Buddhist Centres attended the ceremony headed by Most Venerable Bogoda Seelawimala Nayaka Thero, (The Chief Prelate of UK, President of Sri Lankan Monks Council in UK & Head Monk of London Buddhist Vihara), Reverend Dr Sumanasiri (Head of Realist Buddhist Vihara Association), Venerable Bhikkhu Assaji (Religious Minister of Thames Buddhist Vihara), Venerable Gunnepana Sumanarama Thero (Head of Edmonton Samadhi Meditation Centre), Venerable Pasgoda Piyarathana Thero (Resident monk of ESMC) and Venerable Luangpoh B (Cambridge Tai Buddhist Centre Metta-UK, Harston). A large number of distinguished guests headed by H.E. Dr Chris Nonis (Sri Lankan High Commissioner in London) graced the occasion with Councillor Mr Michael Weeks (Chairman of North Hertfordshire District Council) and Mrs Kay Weeks, Councillor Mrs Joan Kirby (Vice Chairman of NHDC), Mrs Dr Kokila Waidyaratne (Minister of Media & Information, Sri Lanka High Commission in London), Mr H K M Herath (Minister Cultural Affairs, SLHC in London), Councillor Mr Michael Paterson (Letchworth Committee Chairman of NHDC), Reverend Michael Roden (Chairman of North Herts Interfaith Forum & Rector of Hitchin) and Mr Lakith Cooray (President Reality UK). Special Congratulatory Messages were received from Her Majesty The Queen, Lord Charles Cecil (The High Sheriff of Hertfordshire), Mr Oliver Heald MP (Member of Parliament for North East Hertfordshire) and Venerable Kamburawala Rewatha Thero (Chief Prelate & Head of Scotland Buddhist Centre). Reverend Dr Sumanasiri delivered the keynote speech on "Buddhism: The Science of Happiness, not a Message of Suffering." Venerable Bhikkhu Assaji conducted a guided meditation with a reflection on qualities of the Lord Buddha and his teachings. Reverend Michael Roden conducted the Interfaith Blessings to mark the objectives of the ceremony. 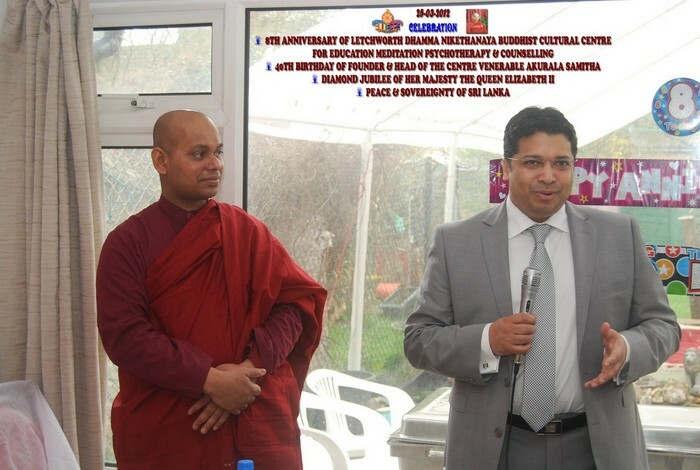 Venerable Bogoda Seelawimala Nayaka Thero, Chief Prelate of UK, Sri Lankan High Commissioner H.E. Dr Chris Nonis, North Hertfordshire District Council Chairman Councillor Mr Michael Weeks, Vice Chairman Cllr Mrs Joan Kirby and NHDC Letchworth Committee Chairman Cllr Mr Michael Paterson also addressed the occasion. Conducting a "Special Twenty Eight Buddhas Blessing Pooja" to offer the newly brought Buddha Statues sculpted in Sri Lanka for exclusive veneration at the centre, Venerable Akurala Samitha conveyed heartfelt gratitude and thanks with blessings for those who worked tirelessly to make the ceremony a success. Special thanks were also dedicated to Venerable Ratnapure Nanda Thero (Sariputhra Vihara, Narahenpita) for preparing the Buddha Statues, Mrs Dr Kokila Waidyaratne (Minister Media & Information, SLHC in London) and all at Sri Lankan High Commission in London, Colonel Asitha Bandara, Director and staff of Sri Lankan Airline, Mr Lional Kariyawasam, Miss Padma Wijeratne, Mr Anthony Hettiarachchi (Director, Sara Care Home) and Reality UK charity for learning disability for undertaking to bring the statues on time carefully and respectfully. Venerable Akurala Samitha sincerely appreciated the continuing support given by members and supporters of Dhamma Nikethanaya over the last 8 years, without which this anniversary celebration would have been impossible. We are grateful to all the people who have been supporting us through standing orders and/or one off donations. This is a time for gratitude and reflection. Everyone's support was greatly benefited and enabled the temple in support and growth from strength to strength. Unfortunately the running costs of the temple are still higher than the money that is being received, but we sincerely and kindly appreciate everyone's ungrudging support. May the Triple Gem Bless you All. May you all be well, secure, peaceful and happy and attain the lasting bliss of Nibbana!